In an attempt to deal with the disappointing fact that a Teddy bear will probably run away with Potted’s container contest’s top prize (and I won’t), I went shopping. This is not a new tactic for me; buying something I really love can go a long way in making me forget something unpleasant. The venue, however, is relatively new, we’ve been there just one other time. An interesting spot, it’s contained inside the chain-linked end yard of a large building that houses an army surplus store. I’d been attracted by what seemed to be a growing accumulation of intriguing stuff in the yard, although I wasn’t sure what the stuff was exactly. After months of taking quick note as we whizzed past, we finally stopped and took a good look … and I loved what I saw. Getting into the yard required a little effort but it was worth it, there was lots to see; and after careful consideration I came away with a large metal lantern, a huge, hernia-inducing rusted steel chain, a ceramic garden stool in turquoise, and the feeling that I should check back often … this place was terrific! So, we returned today, got into the yard with no problem and met the proprietor: earnest architectural salvager, and all-round cool stuff hunter/gatherer, Stephen Penn. A terrific guy who obviously loves the hunt, he’s slowly turning the army surplus’s yard into a go-to place for unusual garden items. 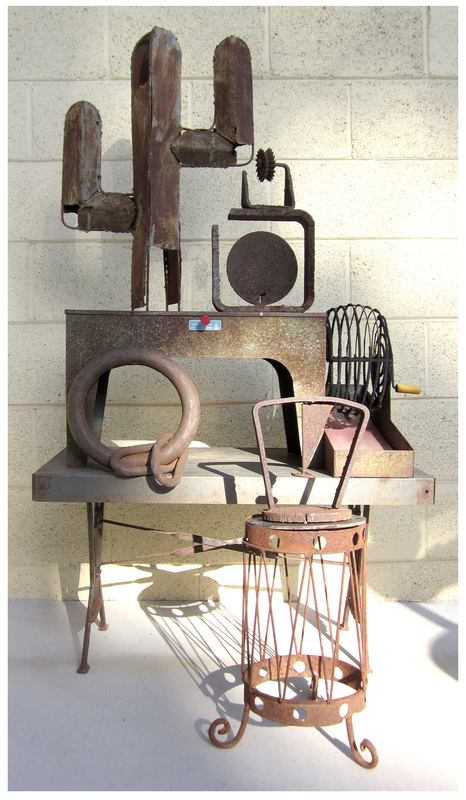 Today’s takeaways are above: A rusted old cactus sculpture; the end-ring of another massive chain, with two links; two interesting welded steel abstract art pieces; a scroll-y, drum stand; and my happy piece: an old rusted bingo caller’s contraption! Losing a planted container contest but finding a rusty ol’ vintage bingo machine? Winning! Isn’t it the best bingo machine ever?! You’re simply the best, as Tina said. Wonderful finds! When I saw the first photo it looked just like a sculptural representation of a sewing machine on a table, complete with sewing chair and ummm…cactus-shaped thread holder. Sooper cool! Hah… in the first photo an old sewing machine stand’s legs are propping everything up… good call! you ARE a winner!! total SCORE! i would do (almost) anything for that rusty cactus! as for the potted contest, you had my vote. next time! Aw, thanks… yup, I love all my new junk!